"You won't like me when I'm angry" might make sense as a tagline for an angsty green monster like the incredible hulk. A pudgy little pink one? Not so much. Nintendo's longtime Kirby developer HAL Laboratories has finally opened up about a perplexing facet of the character: why an otherwise cheerful small pink ball looks so grumpy in the advertising and packaging materials for the American versions of the games in comparison to the much cuter versions released in Japan. As many a side-by-side comparison of the cover art for the Japanese and American versions of a Kirby game shows, the U.S. versions always show the guy being, well, grumpier than his Eastern counterpart. 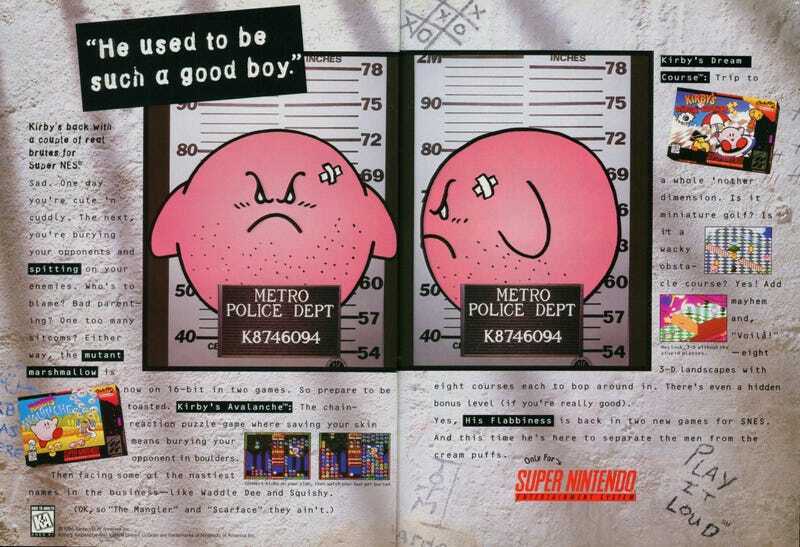 A print advertisement (see above) for the 1995 puzzle game Kirby's Avalanche even went as far as grittifying Kirby with stubble and a face bandage. Speaking to GameSpot, Shinya Kumazaki, the director of the upcoming 3DS game Kirby: Triple Deluxe explained that developers made Kirby surlier in the U.S. because they thought Americans would prefer him that way. "For the Japanese versions we are, at HAL, involved in everything throughout development, including the package design," Kumazaki said. "The most powerful image of Kirby," then, is the cute one, since they "think that's the one that appeals to the widest audience." Cute Kirby, in other words, "brings in the most people to play" the game in Japan. But Kumazaki added that the developers at HAL "know there is a serious side to Kirby as well, and throughout the gameplay we see more and more of that, and the games themselves have quite a bit of depth." So in the U.S., where Nintendo of America holds more sway and has given HAL "feedback and insight" into bringing Kirby to a Western audience, the company thinks they have to toughen the little pink guy up a bit. "What we have heard is that strong, tough Kirby that's really battling hard is a more appealing sign of Kirby, so that's what we feature in the U.S.," Kumazaki said. Given that U.S. recently birthed a celebrity in the form of a small cat who looks like she's perpetually frowning, I can't say that I'm shocked by the news that Nintendo figured out Americans like their cute with dollop of sass on top. Still, it's interesting to compare a character like Kirby to Toy Story's Woody, who started out as much more of a jerk in early drafts of Pixar's classic film. Any version of Kirby is a cute Kirby in my book. But the localized versions of the guy just go to show how much time, energy, and (last but not least) money can be pored into qualifying that cuteness.